We've worked with Infusionsoft since 2004 and have received advanced training from the Infusionsoft Company in London and Orlando. Couldn't get easier if we tried. 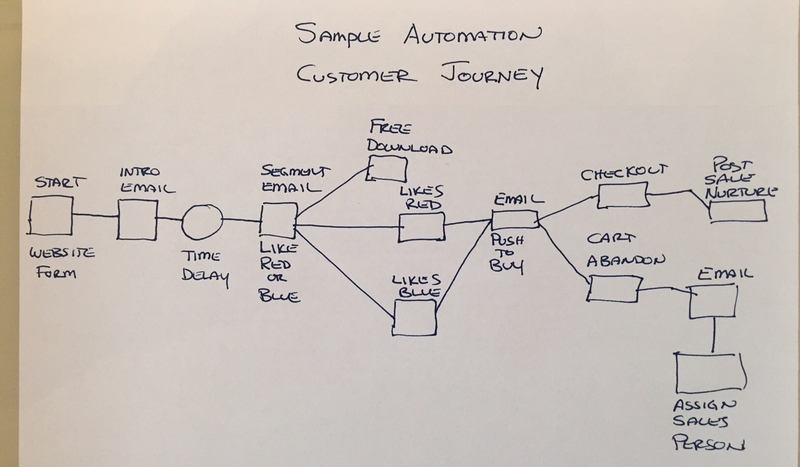 Simply draw out the automation path you want your customers to travel, scan or take a picture of it with your smart phone (as you see in this sample) and email it to us…then we’ll make your dream a reality. That’s what we call a ‘Game Changer’! We utilize all the features Infusionsoft has to offer to completely automate your sales and marketing processes. Below are just a few samples of client projects we've completed and how we structured their solutions. Funnels are a very high converting sales strategy. We were able to develop funnels using Infusionsoft code to include 1 click up-sells (after the first page, credit card entry is not required) and page abandon customer captures. Watch how we did it. We integrated WordPress subscription and course plugins with Infusionsoft to keep the website branding on purchasing and content delivery as well as included Infusionsoft's automation to up-sell new courses when customers were nearing the end of courses they were working on. This client uses webinars to market their service. We created a campaign to collect visitors, register them for the webinar, and push attendance from Infusionsoft to Go To Webinar and back. We were able to market to those who attended and separately to those who missed the webinar. This client sold newsletter subscriptions. We set up the campaign and cart to offer a retail sale. If the visitor abandoned the sale, they were offered a 30 day trial at a substantial discount. After 30 days, they were automatically returned to the regular retail subscription. If you have multiple locations and want to use Infusionsoft's automation to personalize communications from each individual location, in this video we will show you how. Ever have a list go cold? So did this client. We created this campaign to warm up the list (without re-opting in) and convert a cold list to hot buyers. This client came to us because their email account was closed due to spam complaints. With this campaign, we warmed up the list and, of 8500 contacts, had only 1 complaint. The account stayed live and contacts converted. Affiliate marketing is a great way to sell products and services. For this client we created a campaign to allow affiliate marketers to offer his service as a Master Affiliate or regular Affiliate, each having their own commission schedule. We coded a custom API to push data from the clients WordPress website with Rails database to an Infusionsoft campaign we created for prospect conversion.